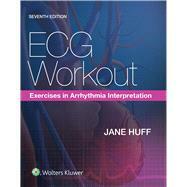 Grasp the electrocardiography basics and identify arrhythmias accurately, with the freshly updated ECG Workout, 7th Edition. Fully addressing the most common arrhythmias, this clearly worded text will take you step-by-step through expert ECG tracing interpretation methods, including differentiating among rhythm groups, equipment use, and management protocols. This is the go-to ECG guide for both student training and professional review—perfect for physicians, nurses, medical and nursing students, paramedics, emergency medical technicians, telemetry technicians, and related practitioners. Get a strong grounding in accurate ECG readings with . . .